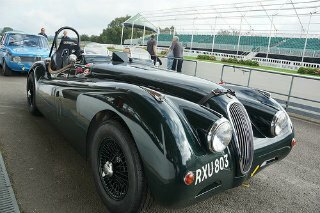 The XK jaguar sports car range began with the XK120 in 1948 (12,061 built) followed by the XK140 in 1954 (8,943 built). In 1957, when the latter car was discontinued, the external styling was beginning to show signs of being dated. 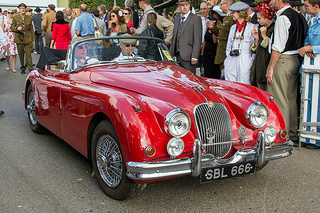 In fact, compared with its two predecessors, the introduction of the XK150 Jaguar sports car in 1957, comprising the fixed head and drop head variants, did not create the same impact, which was surprising since it was a radically revised version, including thinner doors to create more internal space. The new variant continued to use the shortened version of the chassis used in the Mark 5 saloon with rack and pinion steering, which was still not power assisted, whilst the suspension remained unchanged. 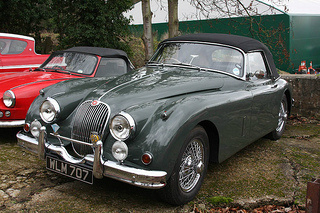 In order to update its appearance, a curved, one-piece windscreen was added, which immediately distinguished it from its predecessors, with their split screens. Further, the fixed head coupe was fitted with a curved and slightly larger rear window, which reflected the current vogue for wrap-around windows. The soft curve of the body from front to back was subject to further restyling, which resulted in less curvature, so producing a slightly heavier image. 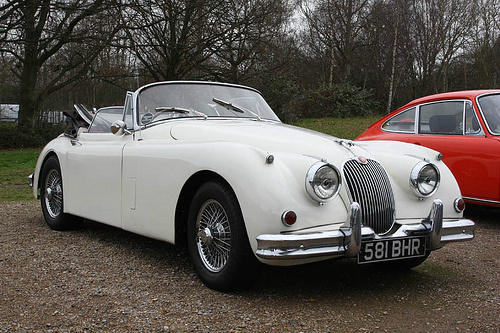 Also, for the first time with Jaguar cars, the convertible was fitted with wind-up windows and push button door handles on the outside. All the variants were fitted with 16 inch wheels, together with servo-assisted Dunlop 12 inch disc brakes all round. In 1958, the convertible was introduced along with the more powerful S-variant. 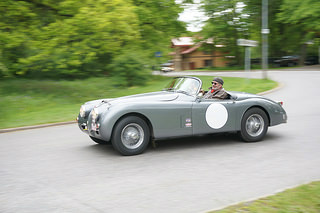 The two seater convertible received some body panel modifications with the area between the windscreen and the bonnet being moved back some four inches, which resulted in a longer bonnet and front wing. 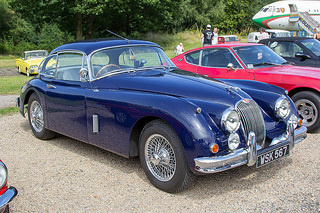 As with its predecessors, the XK150 Jaguar sports car was offered in both the standard and special equipment versions, whilst the latter, fitted with larger exhaust valves, was available in a wide range. 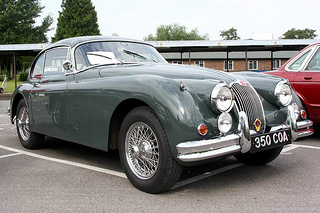 This began in 1958 with the launch of the S-variant, a more powerful version of the 3.4 litre engine, incorporating a straight port cylinder head. Then later in 1959, the 3.8 litre engine was introduced in both the standard and S-variants. All these engines were available to each of the three body styles. The internal trim of the fixed head and drop head coupes was subject to a change, from the previous use of walnut veneer on the dashboard and door panels, to the adoption of leather. 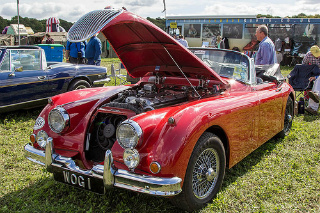 The standard and SE models were fitted with two HD8 SU carburettors, whilst the S-variant used three HD8 SU's. A four speed gearbox was standard equipment, whilst overdrive and a three speed Borg Warner automatic transmission were optional extras, although the latter option was not available on the S-variant. 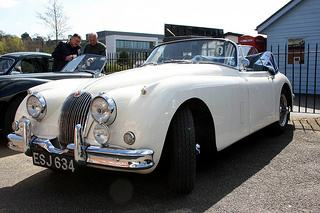 By October 1960, when production of the XK150 sports ended, a total of 9,395 units had been built, which consisted of 2,263 convertibles, 4,450 fixed head coupes, and 2,682 drop head coupes, with almost all the convertibles being exported. Very few "150's" were sold in the standard version. 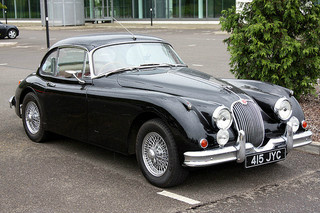 In many ways, this model represented the last of the traditional classic Jaguar sports car. 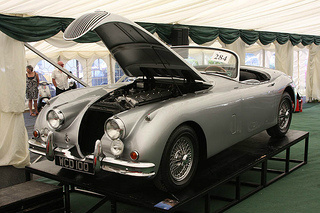 A 1957-60 Jaguar XK150 would fetch in the region of £65,000/$100,000 to £90,000/$145,000, depending on condition, although a really superb example would command as much as £150,000/$240,000.